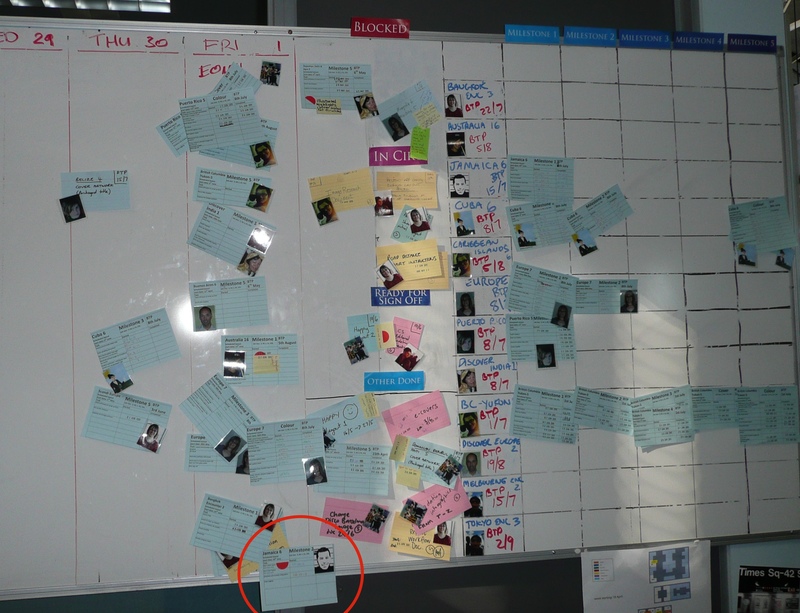 This team wanted to track cycle time, and chose to do this by simply putting a dot on each card every day at standup. This way, you can count the dots on each card in the “done” pile at the end of the iteration (or any time), and understand average cycle time per card, or by point-size. Cycle time for the story below is 6 days. 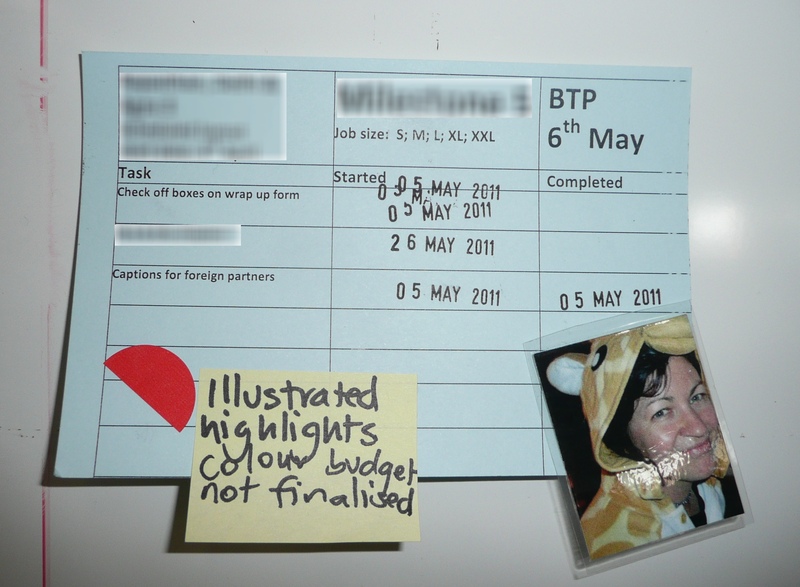 But this team took it a step further, colour-coding the dots by number of days in each process step. So, the card below spent 2 days in the backlog (green dots), then 3 days in build (red), and 2 days in test (black). “Some of the cards had dots going all around the edge of the card!” says Gina. And sometimes the stories bounced back and forth between build and test (you would see this as alternating runs of red and black). Great fodder for retro. This team gets through an enormous amount of work which requires many hand-offs with other departments. 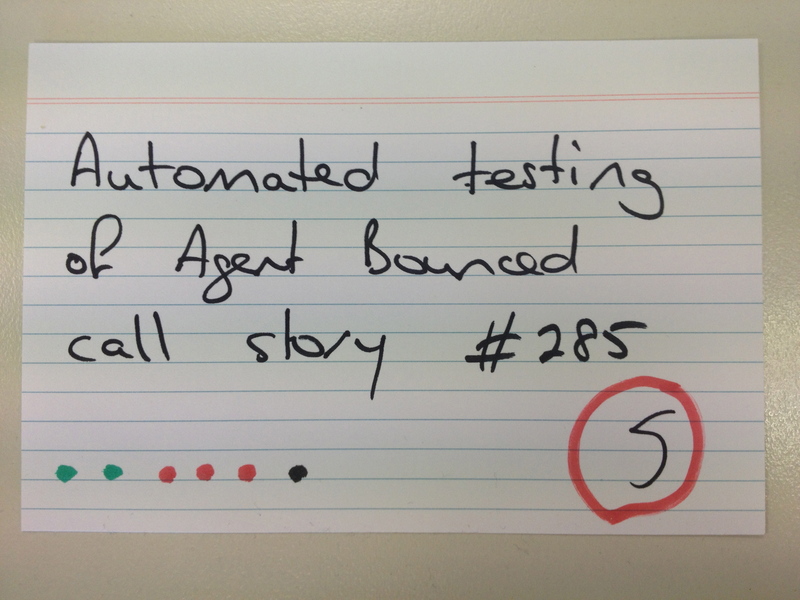 When there’s a glitch in a part of the process, the team member adds a little red sticker to a card, often with an accompanying note about why there was a glitch. If a story accumulates a few of these, we can see it’s in trouble. 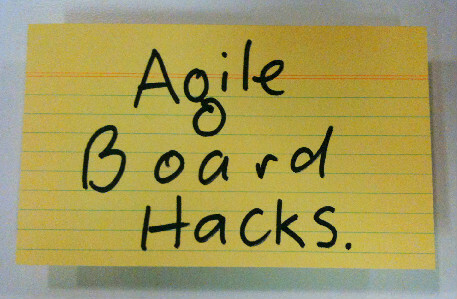 Also, the little stickers are an excellent reminder for retro, where we have a chance to talk about how to address any larger issues that might be driving them, or even use “5 whys” to delve into the root cause of glitches.